At East Village Asian Diner in Hillcrest, it’s all about the monk’s stone pot—and the robot design theme. I can get my head around the former, a slightly westernized take on Koreandolsot bibimbap, but what’s with the robots? Is it just that “bibimbap” is a word a robot might utter? Bibimbap translates from Korean as “mixed rice.” It generally doesn’t arrive at the table mixed, though, but rather as a thick layer of rice capped with neat, segregated sections of toppings ranging from seasoned, steamed vegetables such as carrots and zucchini, light daikon pickles and kimchi or bulgogi (thinly sliced beef marinated in sweet soy and garlic and quickly grilled). The dish is often garnished with egg and topped with gochujang (Korean chile-pepper paste). 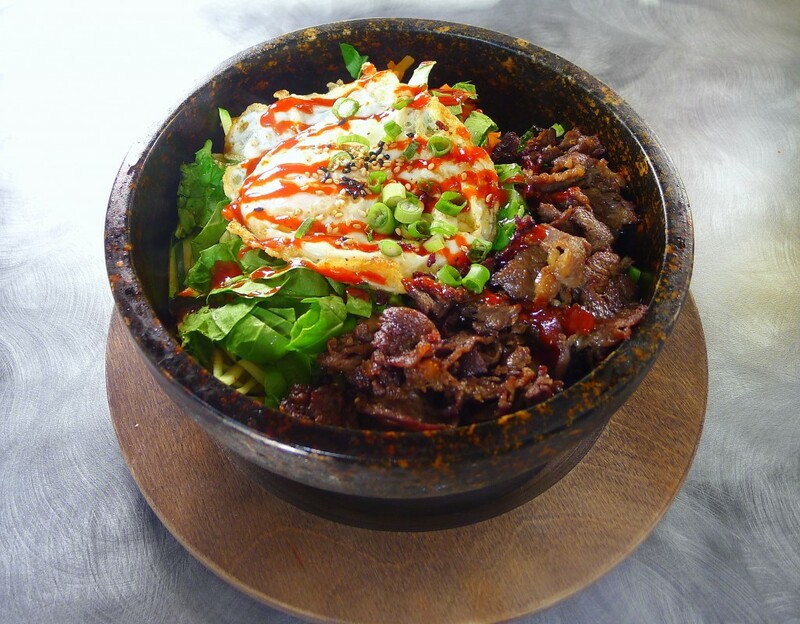 Like bulgogi, bibimbap was listed as one of the world’s 50 best foods in a 2011 CNN Reader’s Poll. Dolsot bibimbap is a variation on bibimbap in which the dish is served in a superheated (300 degrees) stone bowl. The genius of dolsot bibimbap lies in texture. The surface of the stone bowl crisps the bottom layer of the glutinous rice creating a wonderful textural contrast. At East Village Asian Diner (406 University Ave.), the monk’s stone pot is—in name and reality—an Americanized version of dolsot bibimbap. Each monk’s stone pot comes with white or brown rice topped with spinach, fresh julienned zucchini, pickled bamboo shoots and julienned carrots, mushrooms, marinated beansprouts and an over-easy egg, garnished with chopped green onions and a gochujang-like “monk sauce.” You pick your topping from the classic beef bulgogi and kimchi, tofu, pulled pork, chicken, shrimp or salmon. The beef (“Mongolian monk”s) and tofu (“Shaolin monk”s) are excellent. The bowl announces itself with a seething sizzle. Tempting as it may be to dig right in, it’s better to wait, allowing that crispy layer to form at the bottom. When you’ve waited as long as you will, mix the ingredients, pop the egg yolk and enjoy a riotous array of fresh vegetables, protein and rice. The monk sauce (which is billed as house-made) and a ponzu-like “EV Soba” sauce (in tabletop squeeze bottles) provide hints of heat and acid. But it’s the textural contrasts that are the true pleasure of the dish: Crispy, smoky charred rice parties in your mouth with the supple, soft stuff in the middle. East Village Asian also offers noodle dishes, salads, burritos and “snacks.” Perhaps the best of the latter is the kimchi-chive street-cart pancakes made from ground mung-bean powder. Served with an acidic dipping sauce that tasted like the EV Soba sauce with a bit of the monk sauce and chopped chives, itís an excellent starter for two. East Village Asian’s version of dolsot bibimbap may not be authentic (try Grandma’s Tofu on Convoy Street), but that may not be an altogether bad thing. Freed from the conventions that come with the name and the “Korean restaurant” identity, East Village Asian can offer nontraditional rice and toppings and broader menu choices. But what is with those robots?